How to Manage European Chafer at your Strata Corporation - C&C Property Group Ltd. Does the common property grass areas of your strata corporation show signs of being spongy or have areas or wilted or dead turf? Have areas of turf been turned over by animals and birds? If so, you may have an infestation of the European Chafer. Taking a walk through a park or along many streets in Metro Vancouver, you will notice areas of damaged turf, caused by the European Chafer or animals trying to locate them as a food source. Implementing an active biological control program is essential to control the pest in that pesticide bans in most municipalities make chemical control not an option. The City of North Vancouver has published the following information on its website that your strata council might review when considering how to combat an infestation. The European chafer beetle, Rhizotrogus majalis, is a new turf pest in our region. It has been a serious pest in Eastern North America for some time and was first identified in New Westminster in 2001. 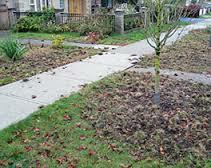 It has since spread into many Metro Vancouver municipalities causing considerable damage to lawns, boulevards and medians. The beetle’s existence on the North Shore was recently confirmed by the District of North Vancouver after increasing reports of damaged lawns and boulevards. Chafer beetles have a one year life cycle and therefore populations can build up quickly and damage turf in parks, golf courses, and residential lawns and boulevards. The grubs feed on roots of many different plants, but prefer the fibrous roots of turf grasses. In drier weather, the damage caused results in the appearance of brown patches in the lawn. Most of the serious turf damage can be caused by birds and animals (especially skunks and crows) digging for grubs. Damage by animals is most severe in the fall and the spring when the grubs are rapidly increasing in size and feeding near the surface. How to tell if you have a chafer beetle infestation? If you have crows, skunks or raccoons digging up your lawn, you may have a European chafer beetle infestation. However, the only way to be sure if you have the European chafer in your lawn is to dig up several test sections in both affected and unaffected areas of your lawn and monitor for grubs when they are near the surface in January to March. To count the grubs, cut 5 samples sections that measure 30cm x30cm (1 sq. Ft.) and 5 cm. The grubs, measuring 2 to 2.5 are soft, white and C-shaped with tan-coloured heads and six prominent legs. If you count 5 or more grubs per square foot, control measures may be warranted. What can you do if you have an infestation? The European chafer is the most difficult to manage “grub” species. Much of the information you may find on the internet or controls for other grub species are not applicable here. Some prevention and control options are lawn maintenance, barriers, and biological controls. Maintaining a healthy lawn is the first step in protecting against grubs. Healthy lawns have a more extensive root system, and can tolerate more grub feeding. Don’t cut your grass too short. Raise your mowing height to 6 to 9cm (2.5 to 3 inches), since beetles prefer laying eggs on closely cropped lawns. The higher blades also help protect the soil surface from water loss and encourage deeper root growth. Consider using alternative ground covers such as woody ornamentals on selected area of your lawn. Compact your lawn before eggs hatch in June to early August, as it causes the newly hatched grubs to have difficultly moving, resulting in some mortality. Some residents have had some success preventing chafer infestation with the use of Remay cloth, plastic sheeting, or landscape fabric to cover their lawns before dusk (approximately 9 pm) in June and July when the adult beetles area most active. A cover may prevent mated females from laying eggs in your turf and repeating the cycle. (Note that some covers may need removal each morning). The application of nematodes has proven to be the most effective approach in managing the European chafer. Domestic formulations of naturally-occurring nematodes are available at your local garden centre. Nematodes are tiny microscopic roundworms that move through wet soil looking for insect larvae to eat. Nematodes are most effective when applied the 3rd-4th week of July when the chafer larvae are small and most vulnerable to nematode infection. Follow application directions on the package. The application area must be well irrigated early in the day so that there is no dry soil in the root zone. Irrigate again for 2 hours prior to application. Mix according to directions and apply in the evening or on a cloudy day. Irrigate again for 2 hours after the application and continue to irrigate twice per week for 3 weeks. (Note that City water permits will be required for irrigation. Get more information on sprinkling permits and regulations.